As a young girl, I dreamed of a career as a dog breeder. I pictured an uncomplicated life in the countryside filled with dogs and frolicking puppies. I now have a life filled with dogs and frolicking puppies… and so much more. My days are also filled with hard physical work, strategic thinking, researching, managing staff and logistics, important decisions about dogs, business, and kennel design, wondrous moments as puppies arrive into the world and the bittersweet departures of my pups to new owners. I had no idea how rewarding and challenging a profession this would become. I assumed it would be a solitary occupation—just me and my dogs—but it has evolved to be very much the opposite. 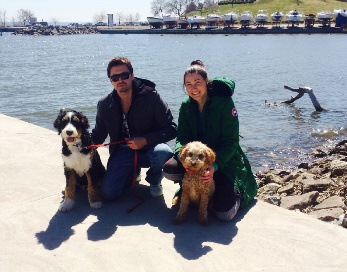 I am surrounded by a huge community of dog lovers, including my staff, my family, my partner and my clients. We all share a common passion. We all know that dogs transform lives and marvel over those small miracles every day. The best thing that ever happened to my career is my mother’s allergies. I joke, but the fact that she wouldn’t allow my dogs in the house was the impetus to breed allergy-friendly, low-shedding dogs. At that time, the Goldendoodle was still uncommon, so for many years, I put my most of my energy into that wonderful hybrid. The second best thing that happened to my career is that my parents insisted I “get an education.” My Veterinary Technician studies not only gave me concrete skills in working with animals, it also expanded my vision for breeding. As I learned about the genetic diseases that afflict so many purebreds, I became determined to do whatever I could to ensure the dogs I produced would be as healthy and long-lived as possible. Despite graduating at the top of my class with a great job offer, I left school even more committed to a career of breeding dogs—and breeding them well. That meant more intensive researching of pedigrees, health testing, and temperament evaluation. It meant becoming ruthless in my selection of breeding stock; any dog that didn’t meet my standards was cut from my breeding program (and placed in a happy pet home!). The costs of this research were high, especially at first, when the best purebred breeders did not want to sell their dogs into a hybrid program. I had to travel to Europe and across North America to find quality kennels and dogs. Eventually, I established relationships with many conscientious breeders and it’s made my job much easier. I was always a perfectionist, but now I’ve become an unapologetic perfectionist. My goal is to breed healthy dogs with wonderful temperaments that just happen to be gorgeous as well. While some might think I’ve achieved that goal, I am always learning and striving to improve my program. That’s how the Bernedoodle came to be. I had pretty much mastered the Goldendoodle, and was successfully producing solid lines of Standard, Mini and Tiny Goldendoodles. Meanwhile, I still bred Bernese Mountain Dogs. I loved their beauty and their sweet nature, but the breed is plagued with serious health problems and has an average life expectancy of just seven years. It was, and still is, extremely difficult to find good breeding stock—a problem I helped address by convincing my mother to apply her considerable talents toward breeding Bernese Mountain Dogs. Developing an excellent Bernedoodle program hasn’t been easy. Bernese are challenging dogs to breed, whether it’s to produce purebreds or hybrids. The coveted tri-color has been far more difficult to achieve than I originally expected; poodle color genes play tricks on breeders. I’ve described my adventures more fully in my book, Bernedoodles: A Head to Tail Guide. Since publication, however, I believe I’ve advanced a few steps in achieving the look I want—keeping in mind that for me, appearance never comes at the expense of health or temperament. I also believe in giving back to the community in the best way I know how: through dogs. I have donated pups to several families of children with special needs. In 2013, I launched the first annual SwissRidge Doodle Romp, where we raised $8,000 for National Service Dogs. In 2014, the funds we raise at the romp will be dedicated to training a dog I’ve donated to a family where two children have special needs. With a busy and growing kennel it’s difficult for me to take downtime, so when my hobbies overlap with my work it’s ideal. For example, I love travelling—especially if I can visit kennels, meet new breeders and pick up a new puppy while away. I enjoy photography, and am happy to lie in snow or mud to get just the right shot—of my dogs! I also work out regularly to stay fit and healthy—for my active job! 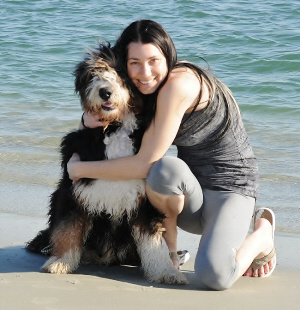 All in all, my favorite activities revolve around animals, and the fact that I can share this interest with my partner, expert dog trainer Lucas Mucha, makes my life so much better and more fun. This is not a life that would suit just anyone, but we feel very blessed and fulfilled.